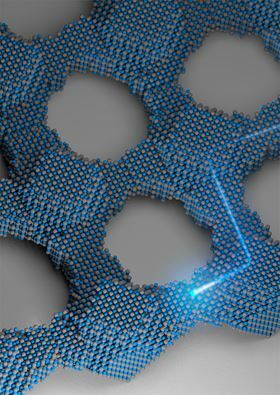 Illustration of a PbSe nanocrystal square superlattice. Courtesy of Tobias Hanrath, Cornell University. The ultimate designer materials created from single-crystal building blocks could enable a new generation of electronic, optoelectronic and photovoltaic devices. Quantum dot nanocrystals can be attached to each other directly or via chemical linkers to create two- or three-dimensional structures known as superlattices. Advances in both these approaches are bringing usable superlattices a step closer, according to researchers. Tobias Hanrath and colleagues from Cornell University have developed a chemical process of epitaxial attachment that connects PbSe nanocrystals into square superlattices a few layers thick [Whitham et al., Nature Materials (2016), doi: 10.1038/nmat 4576]. The attachment process relies on connector molecules — or ligands — to bring together and assemble the nanocrystals, which are then removed to leave a tight connection between the dots. ‘‘As far as the level of perfection, in terms of making the building blocks and connecting them into these superstructures, this is probably as far as you can push it,’’ says Hanrath. Individual nanocrystals click together so effectively and closely that Hanrath and his team have produced some of the highest quality superlattices yet. The high level of fidelity in the structure leads to improved electron coherence and transport properties (see above left). Schematic illustration of the experimental strategy: double stranded DNA bundles (gray) form tetrahedral cages. Single stranded DNA strands on the edges (green) and vertices (red) match up with complementary strands on Au nanoparticles. This results in a single Au particle being trapped inside each tetrahedral cage, and the cages binding together by tethered Au nanoparticles at each vertex. The result is a crystalline nanoparticle lattice that mimics the long-range order of crystalline diamond. The images below the schematic are (left to right): a reconstructed cryo-EM density map of the tetrahedron, a caged particle shown in a negative-staining TEM image, and a diamond superlattice shown at high magnification with cryo-STEM. But even though the superlattices look perfect to the human eye, there is enough variation in the size (±3—5%) and connectivity of the nanocrystals to make the structure imperfect to an electron. Rather like a tower of Jenga blocks, any tiny distortion in the arrangement of the nanocrystals becomes amplified as the structure grows. Nevertheless, the ability to control the size, shape, and composition of the quantum dots and the geometry of their arrangement in a superlattice opens to the door to the design of an enormous wealth of new materials with exotic electronic properties, believes Hanrath. Hanrath and his colleagues are now working on more uniform nanocrystals, better connectivity, different materials, and adding more layers to create three-dimensional structures. Meanwhile, Oleg Gang and his team at Brookhaven National Laboratory, together with coworkers from Nagoya, Wesleyan, and Stony Brook Universities, have used a different approach to create diamond-like structures with Au nanoparticles [Liu et al., Science 351 (2016) 582]. Diamond-like structures are particularly challenging to create because the lattice contains so much open space. To stop the Au nanoparticles assembling tightly together, the researchers added rigid, three-dimensional frames and tethers made out of DNA to the particles. The functionalized nanoparticles then link together via DNA’s pairing mechanism: A binding with T, G binding with C, and so on. By trapping a nanoparticle inside a DNA tetrahedral frame, a diamond-like superlattice can be produced — but with Au nanoparticles instead of carbon atoms (see below). As well as diamond, the researchers use the same approach to create other lattice structures like facecentered cubic (FCC), zinc blende, and some without an atomic counterpart.